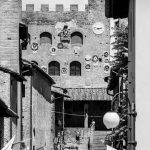 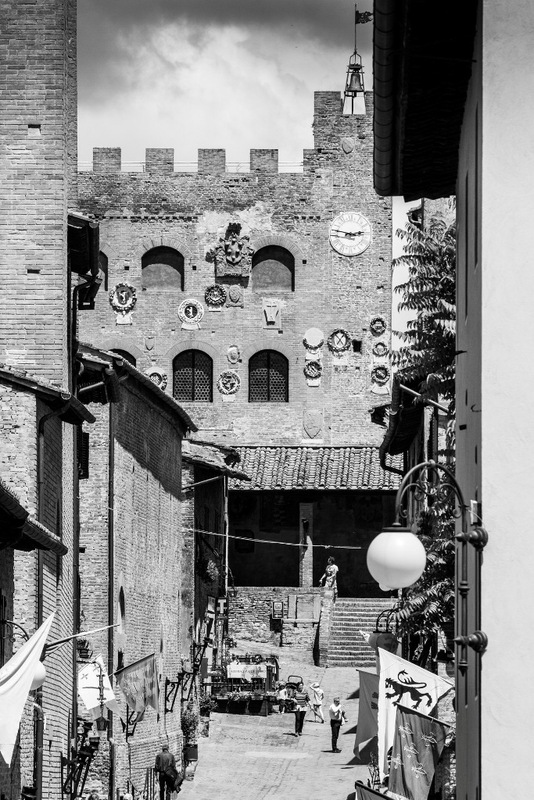 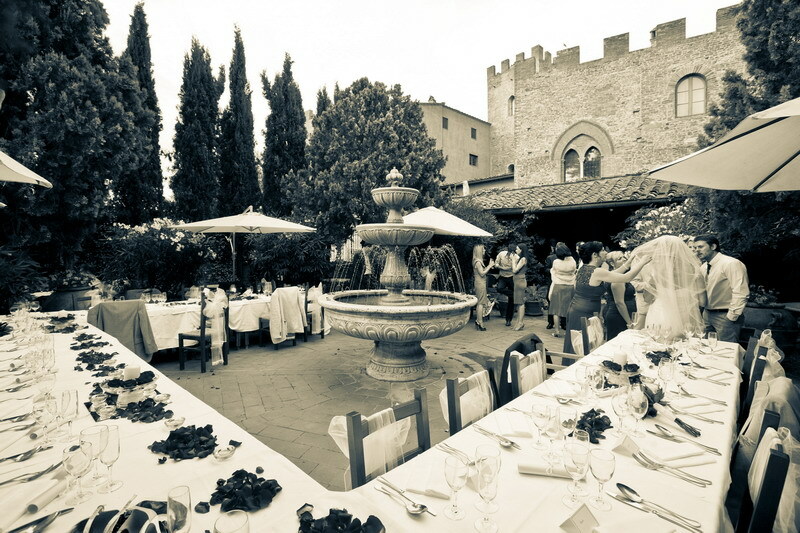 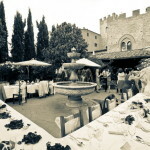 Castello Restaurant is situated in an ancient and noble palace in the center of a medieval town near San Gimignano. 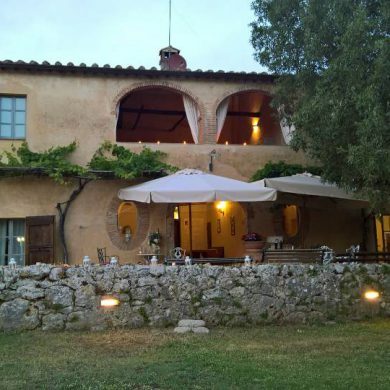 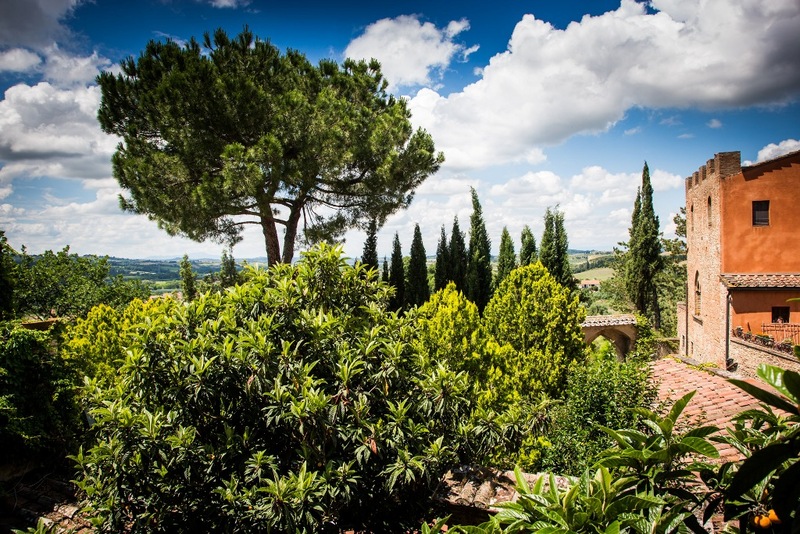 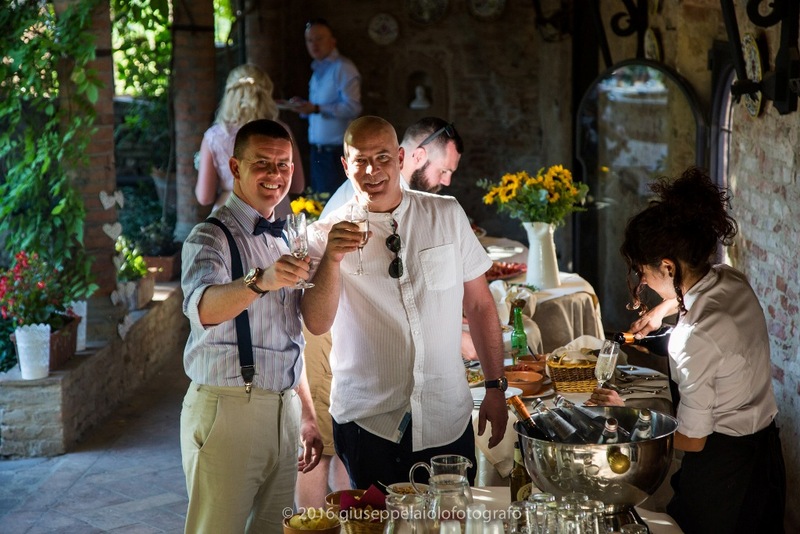 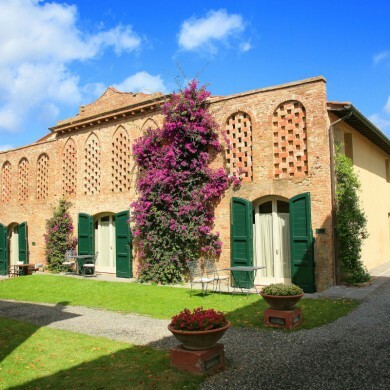 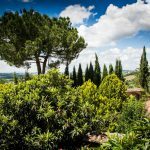 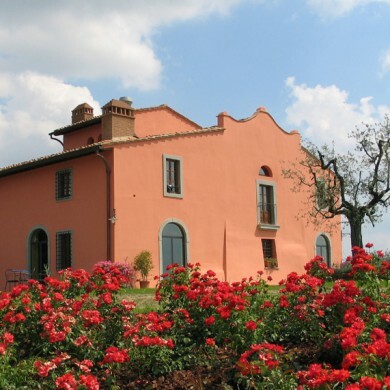 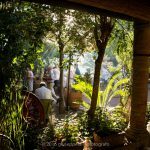 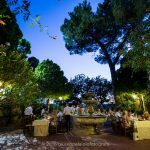 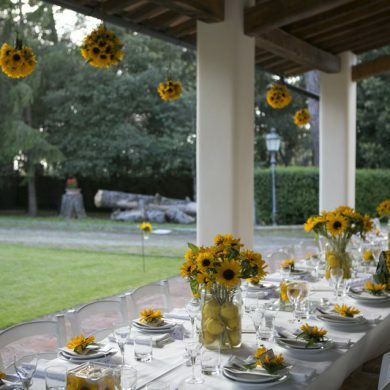 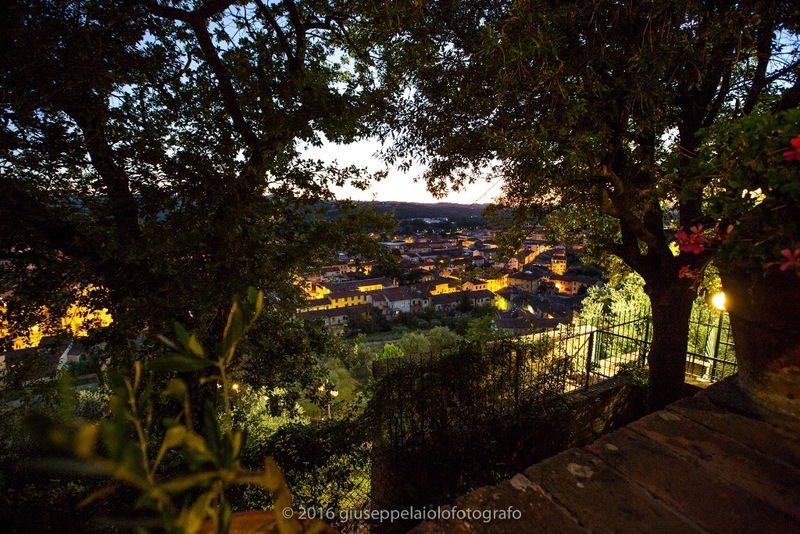 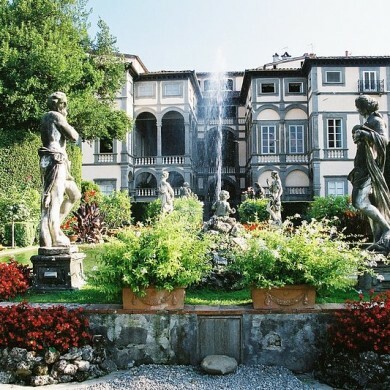 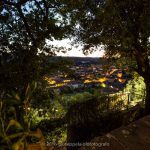 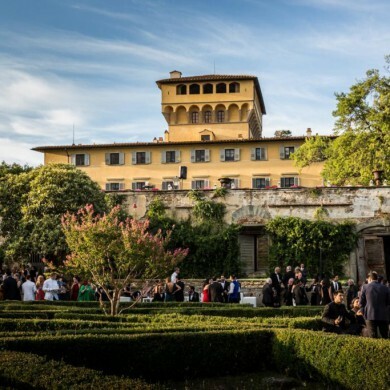 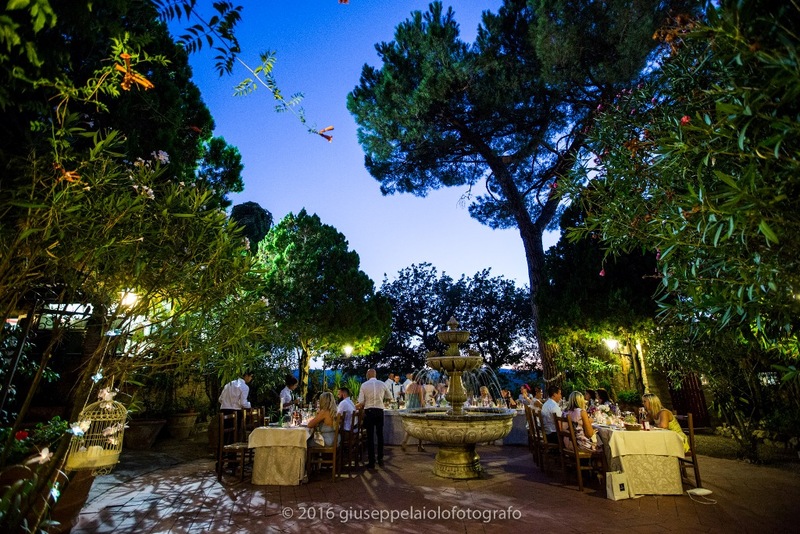 Situated in the heart of Tuscany, between Florence and Siena, Castello Restaurant has large rooms with vaulted ceilings, a magnificent garden terrace that dominates the town below and the surrounding countryside and a lovely covered loggia. 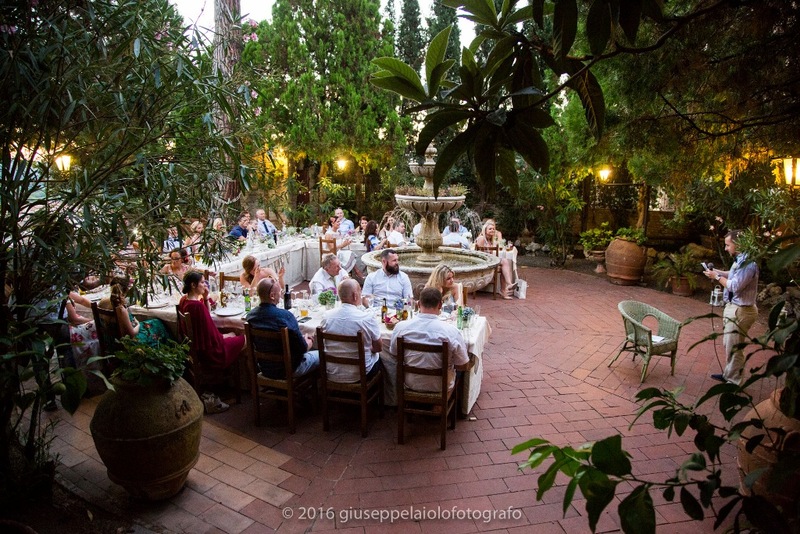 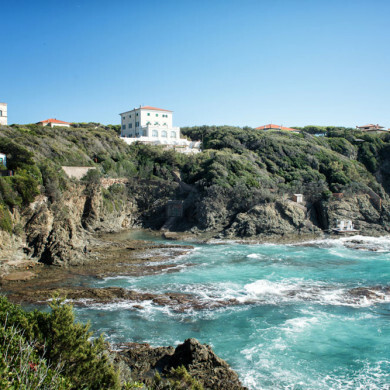 A traditional, family-run restaurant, Castello Restaurant has been serving authentic Tuscan dishes for over half a century. 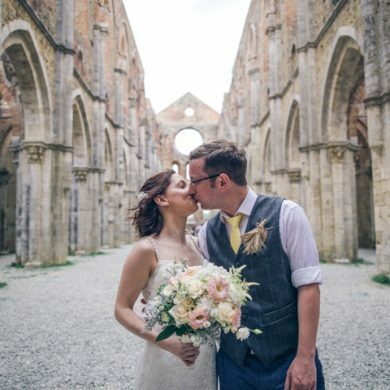 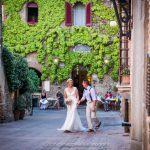 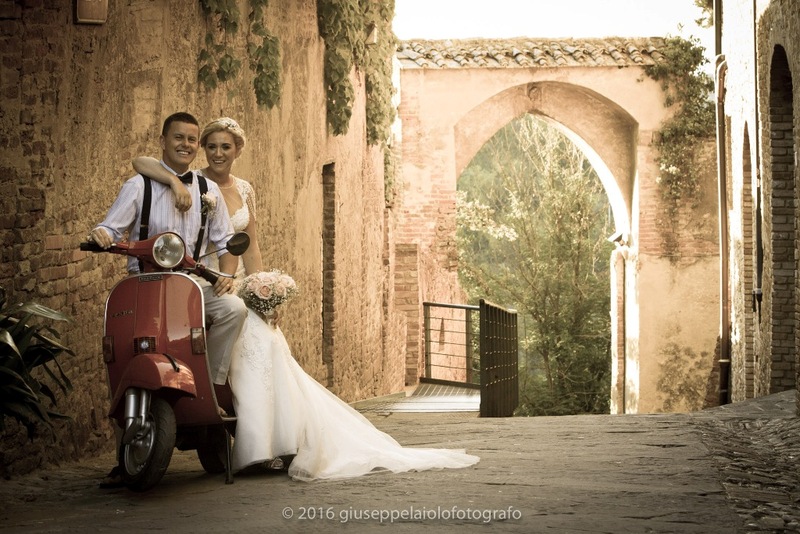 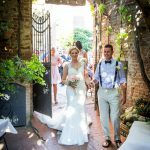 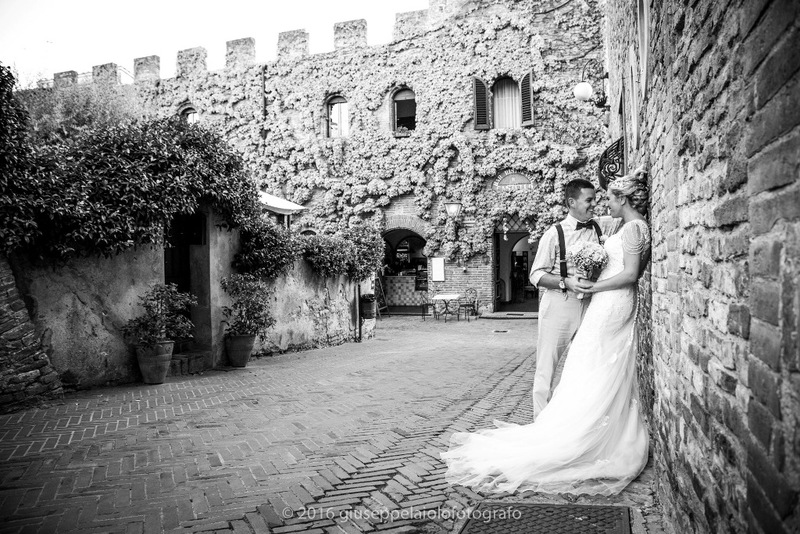 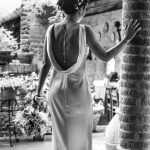 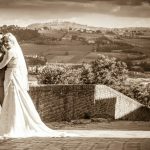 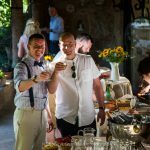 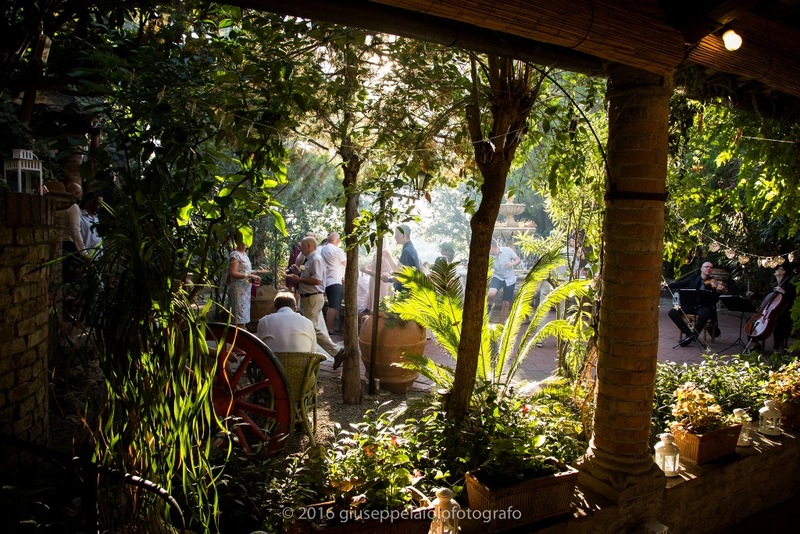 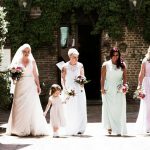 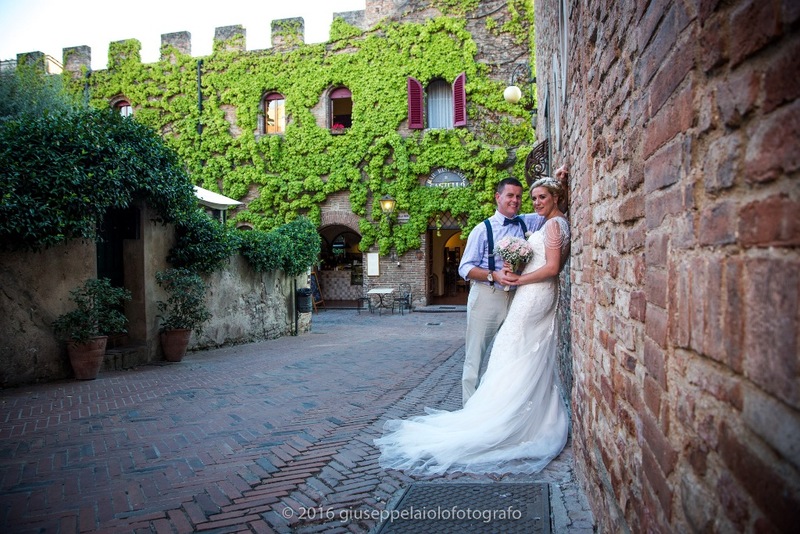 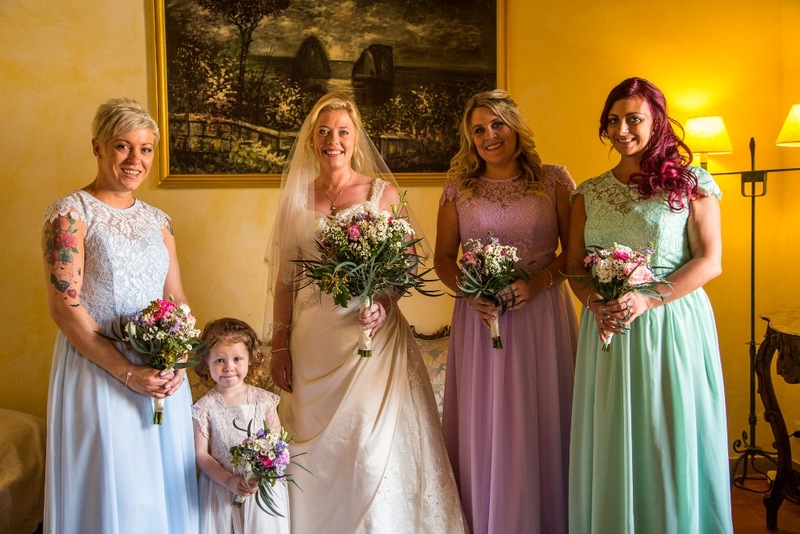 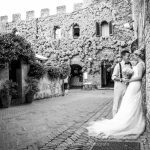 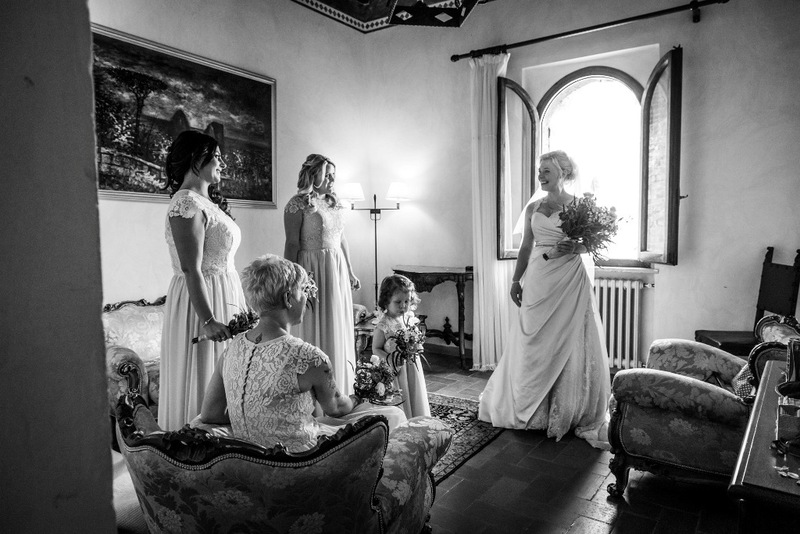 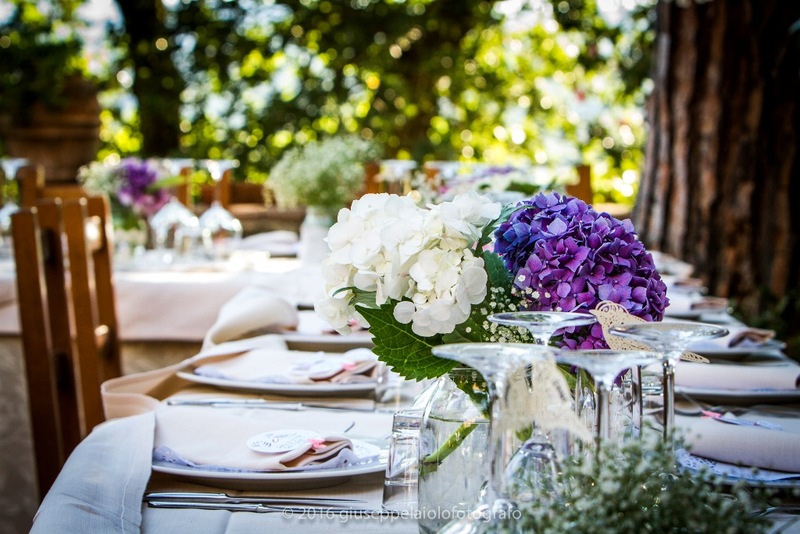 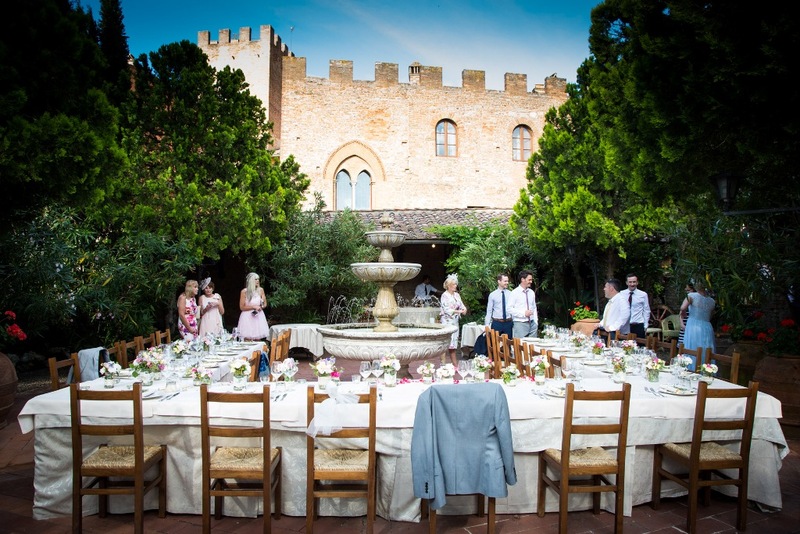 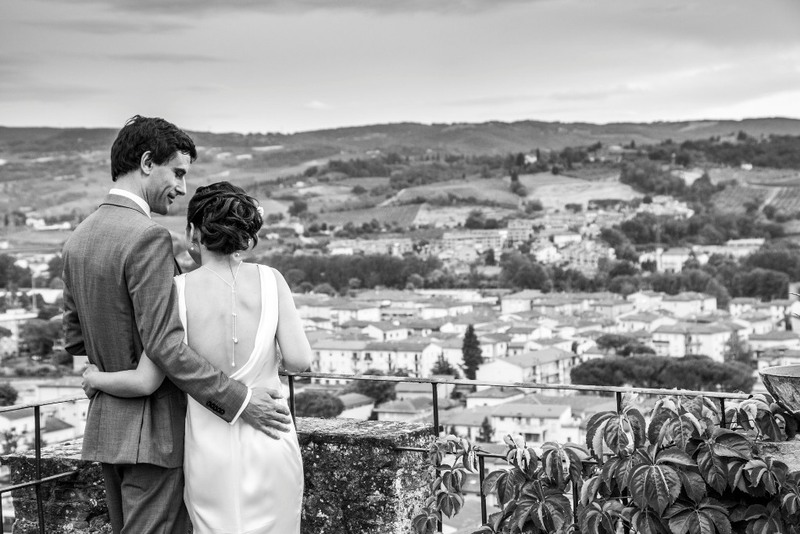 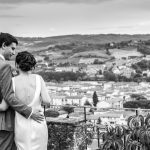 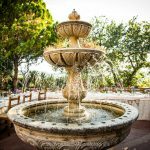 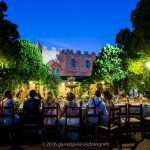 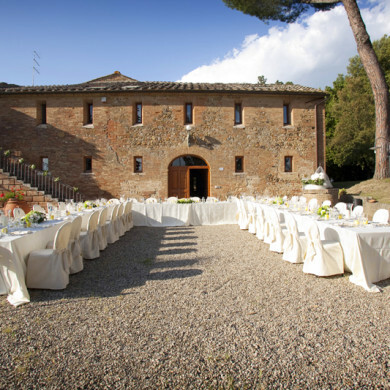 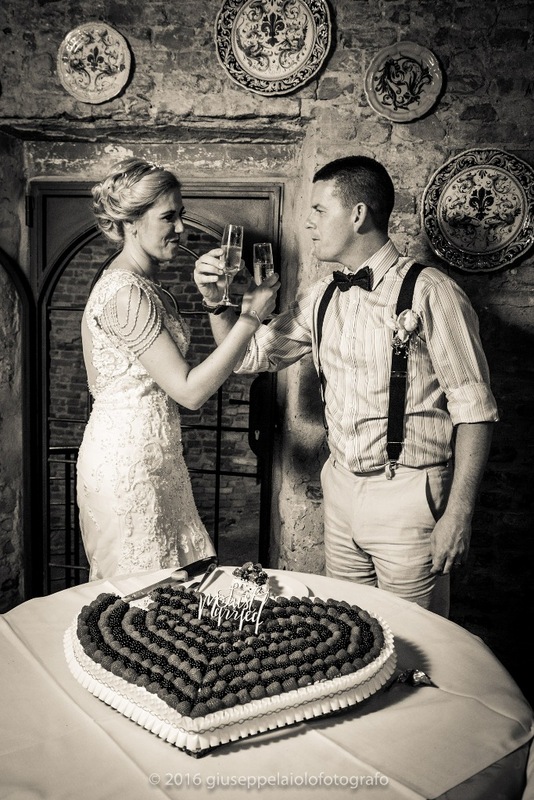 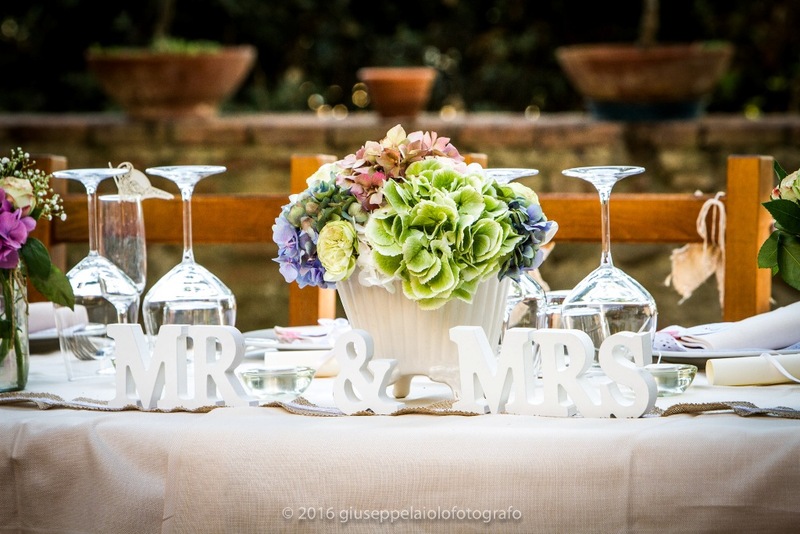 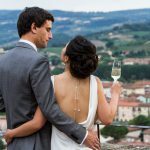 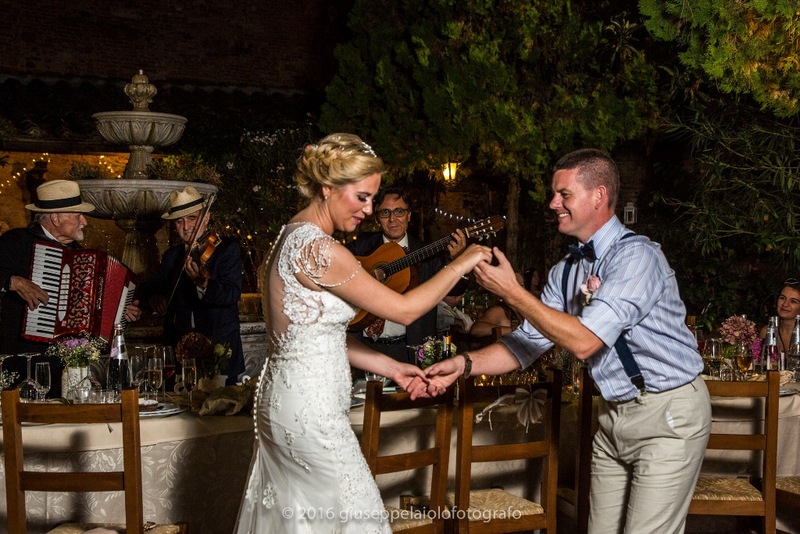 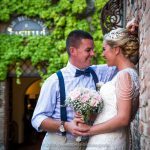 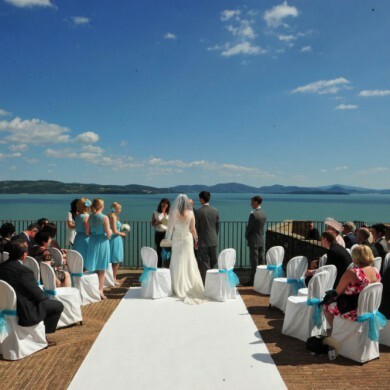 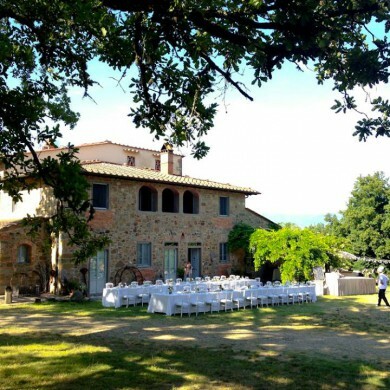 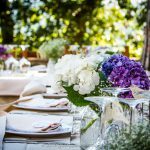 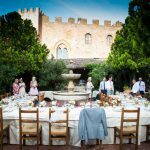 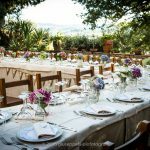 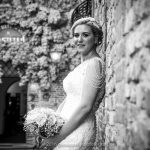 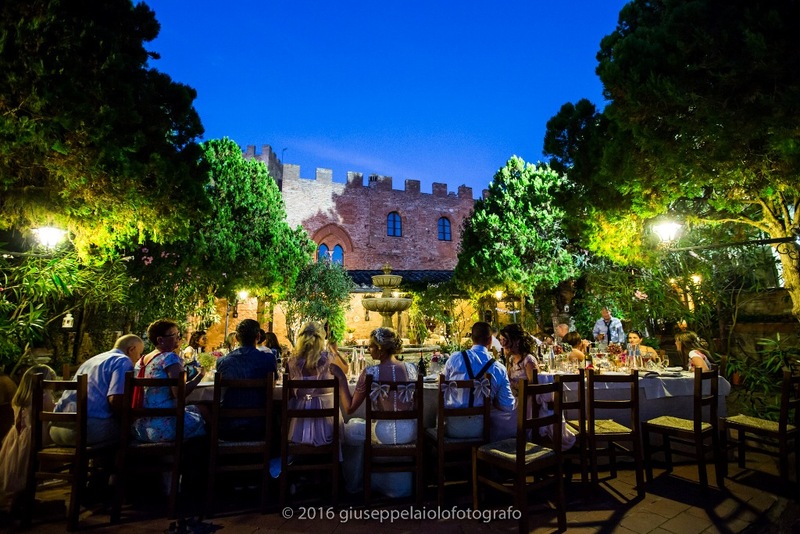 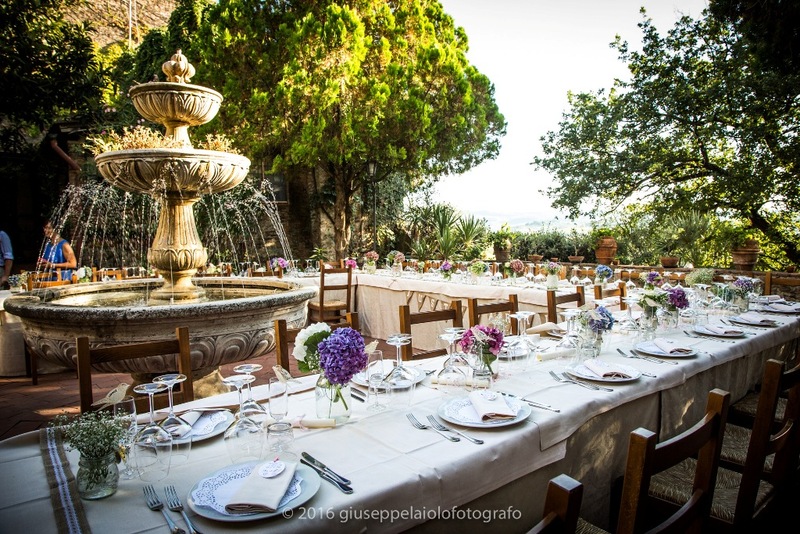 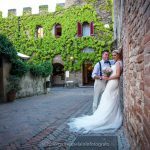 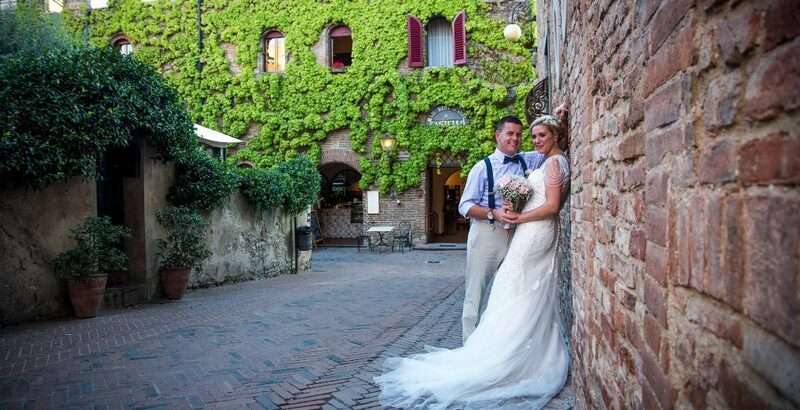 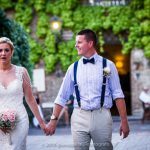 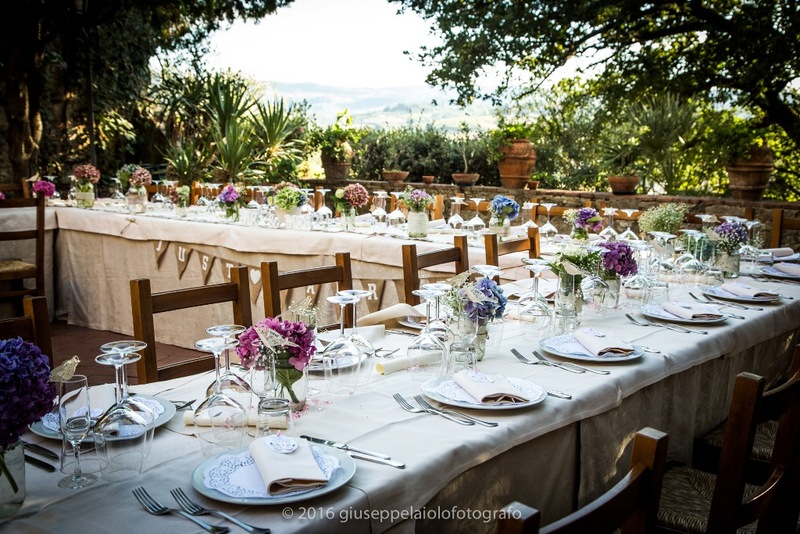 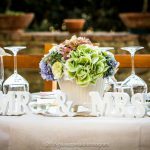 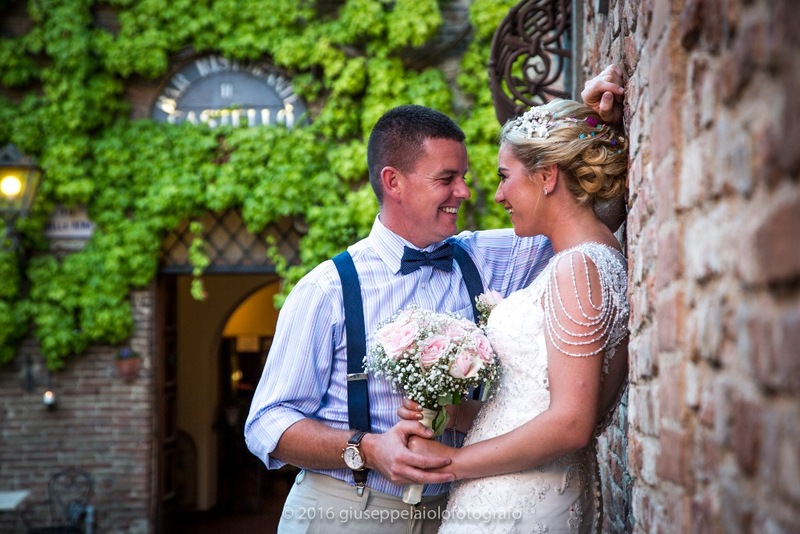 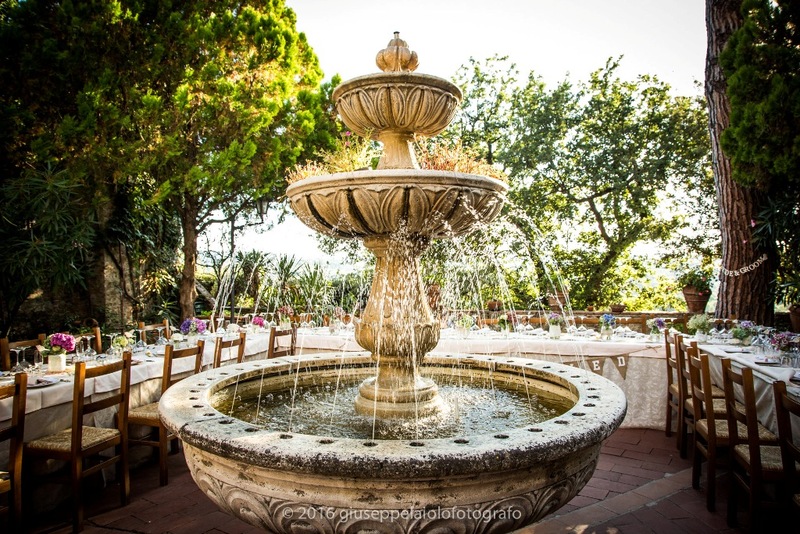 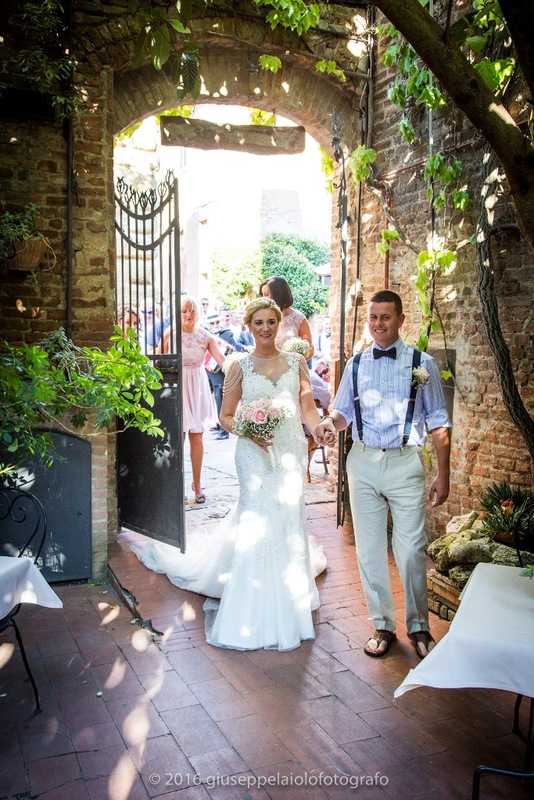 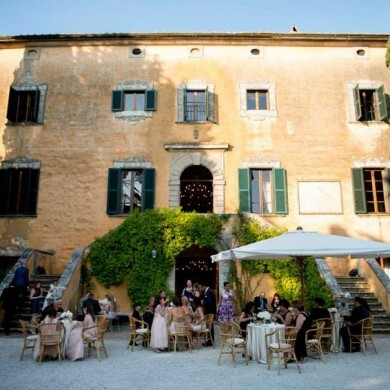 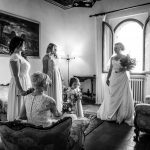 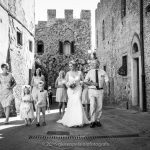 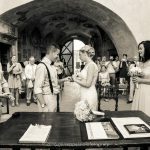 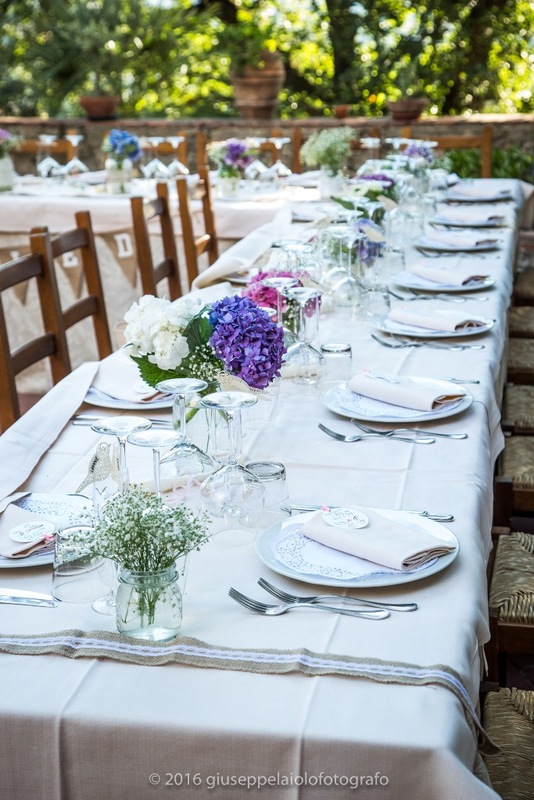 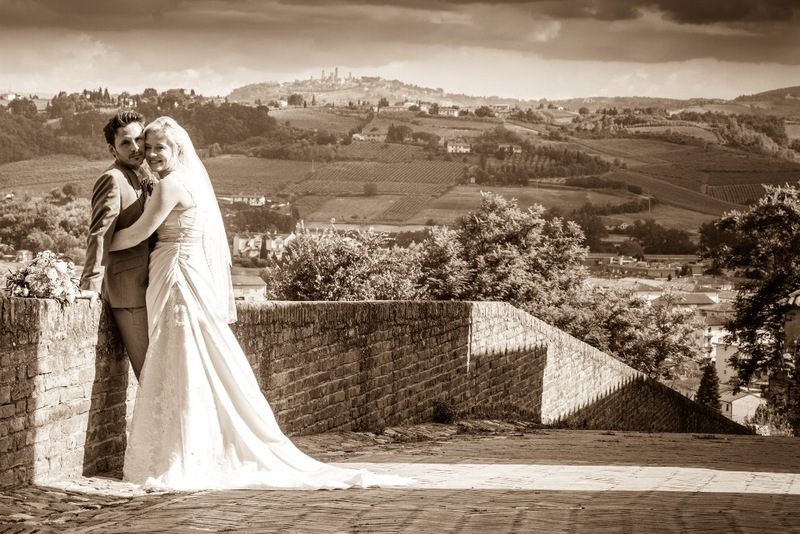 The historically rich, romantic setting, amazing views, acclaimed traditional cuisine make Castello Restaurant an ideal venue for Tuscan wedding. 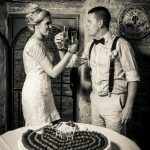 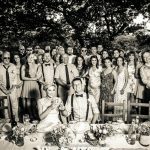 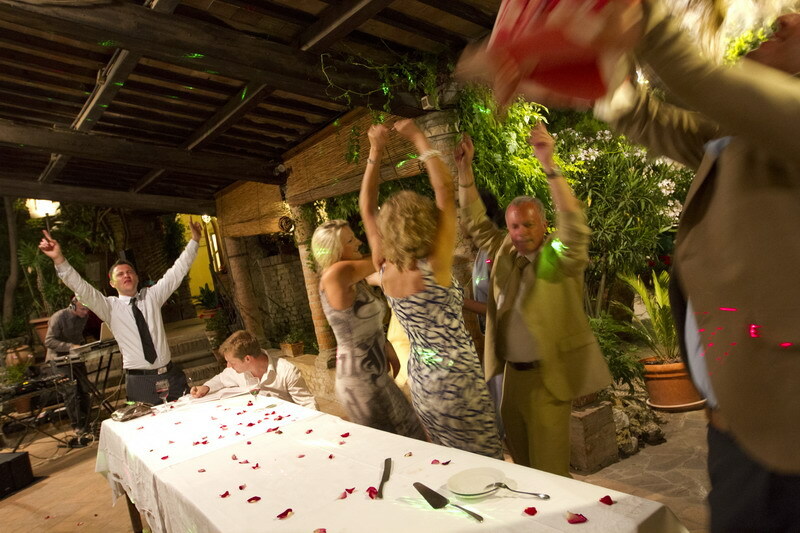 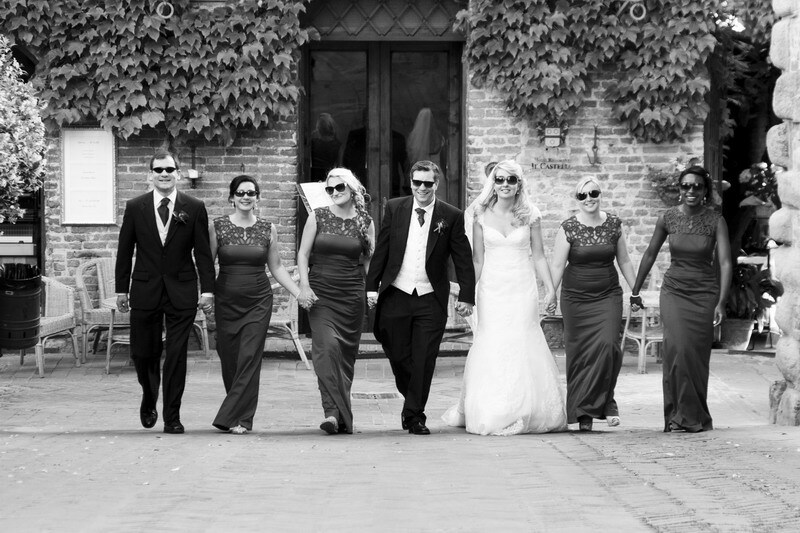 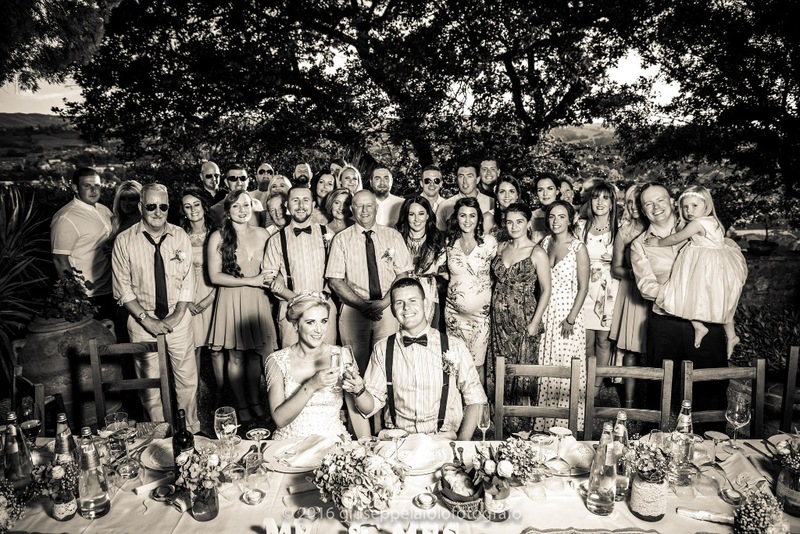 The restaurant is ideal for wedding from a minimum of 25 to 40 guests. 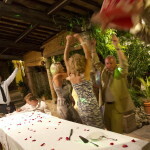 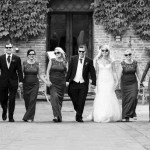 It also offer personal waitressing service for intimate weddings. 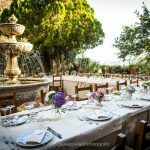 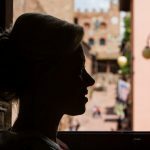 There is a small, comfortable hotel located above the restaurant; these 5 rooms can be rented for you to prepare for your unique day. 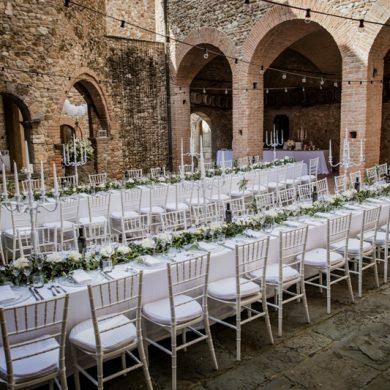 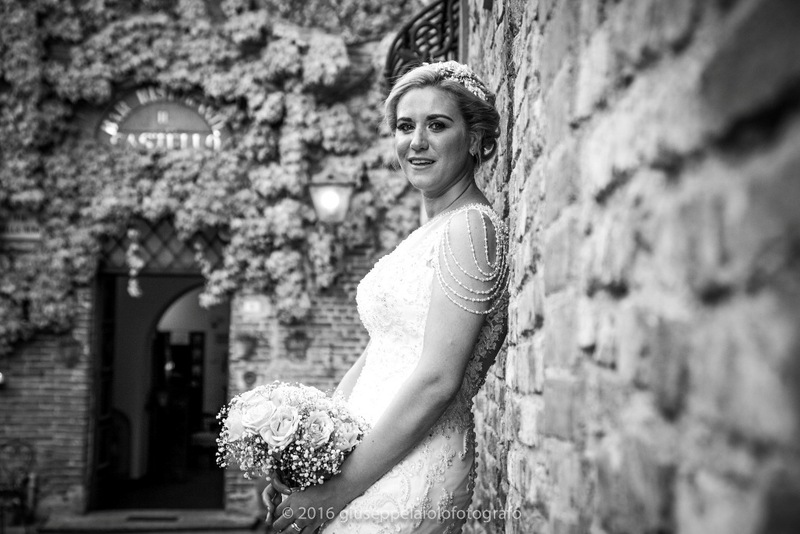 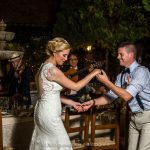 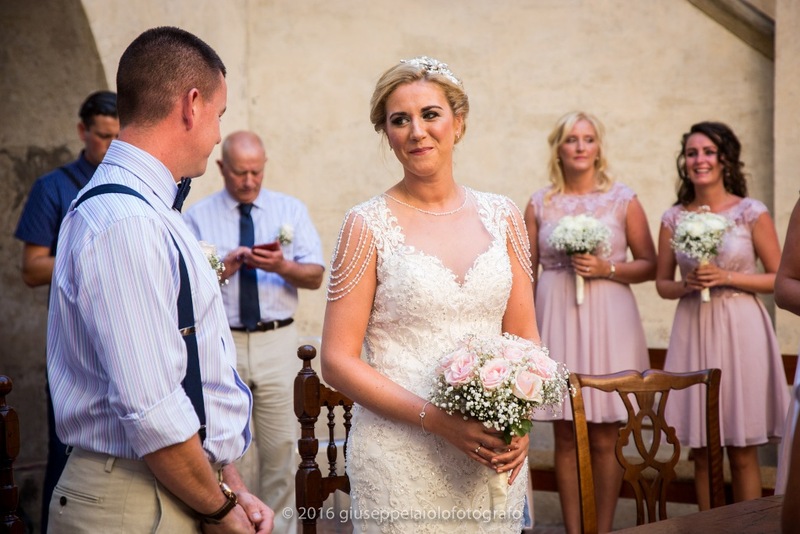 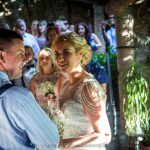 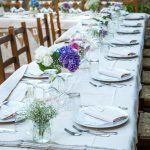 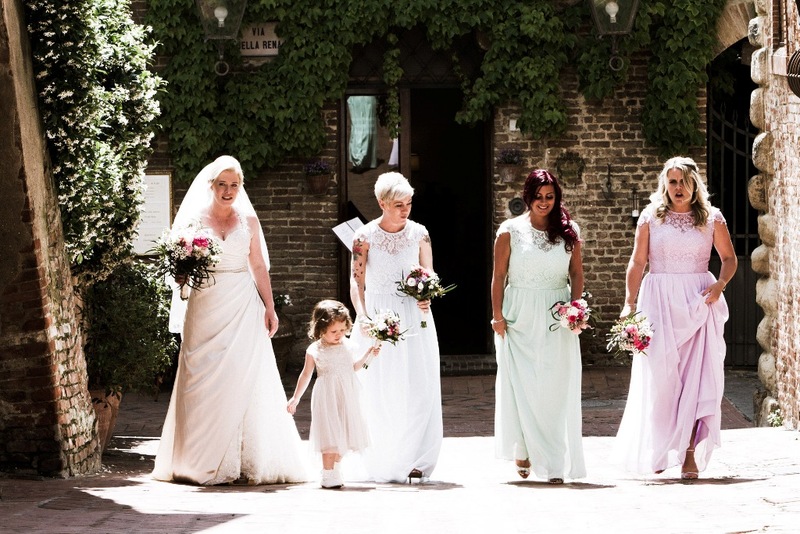 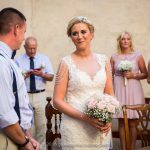 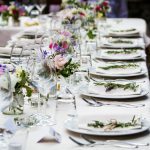 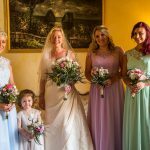 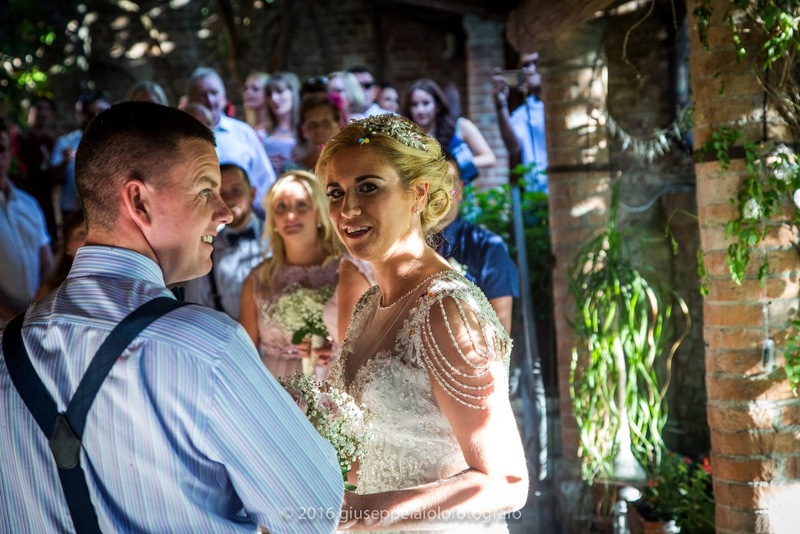 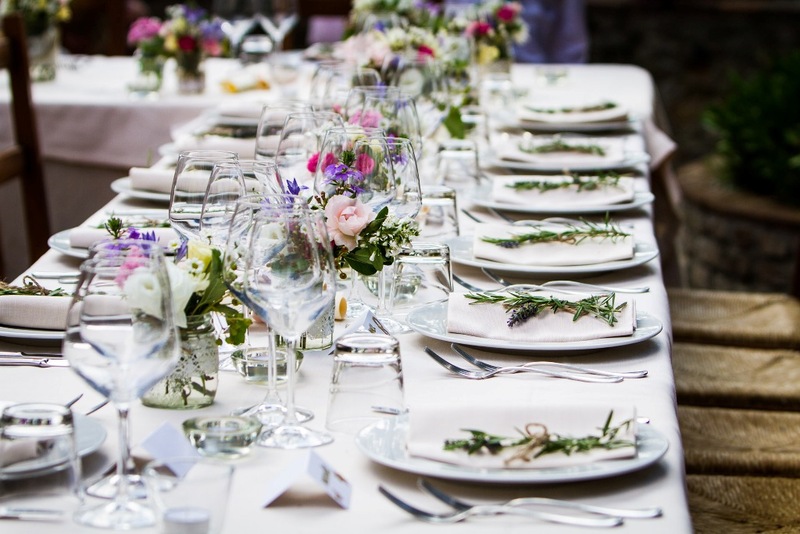 You can choose to hold the wedding reception in the beautiful courtyard or inside the restaurant’s main room which is full of charm and character. 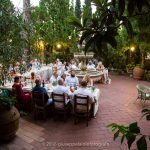 The restaurant can sit up to 40 guests and there is a minimum requirement of 25 guests. 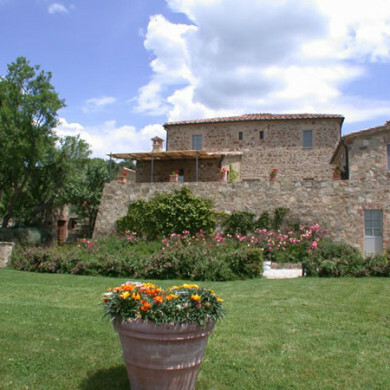 We would be happy to suggest some lovely accommodation options in the area. 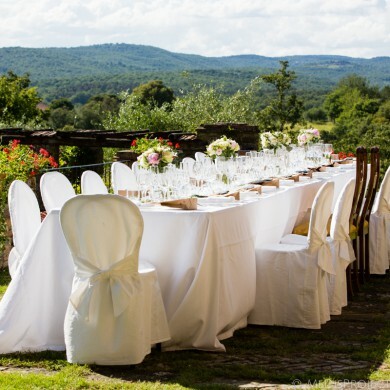 The restaurant also has 5 bedrooms that can be hired for the bride and bridesmaids to get prepared. 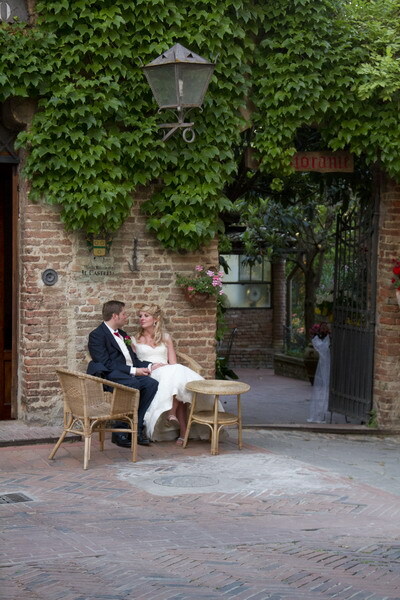 The civil wedding can be held in the nearby Town Hall. 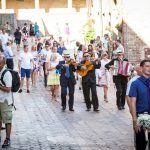 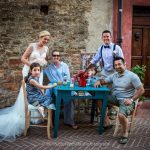 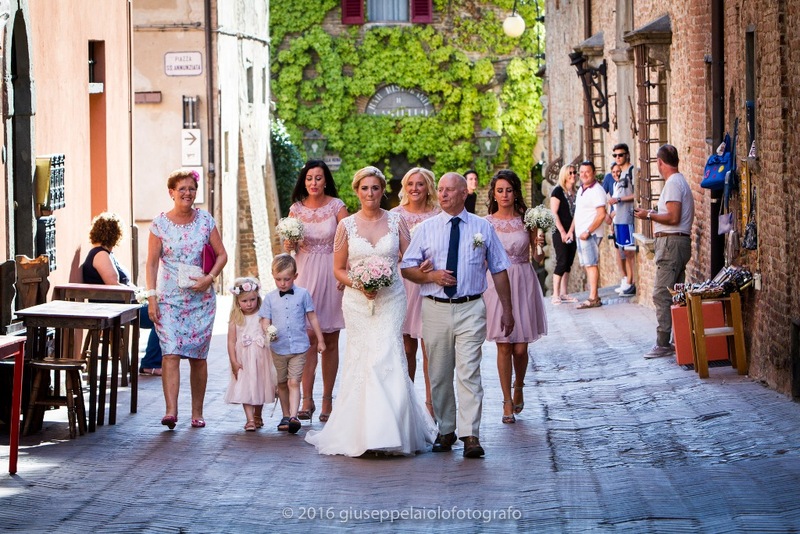 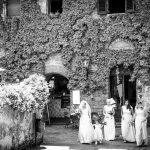 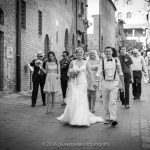 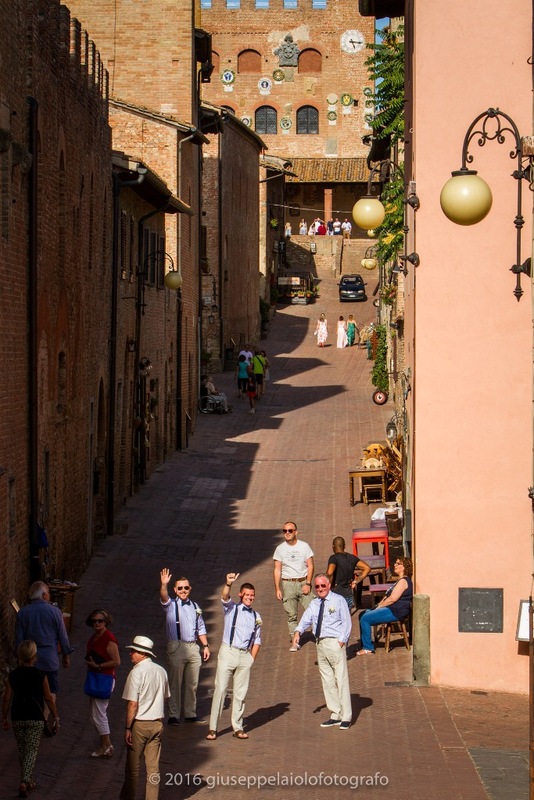 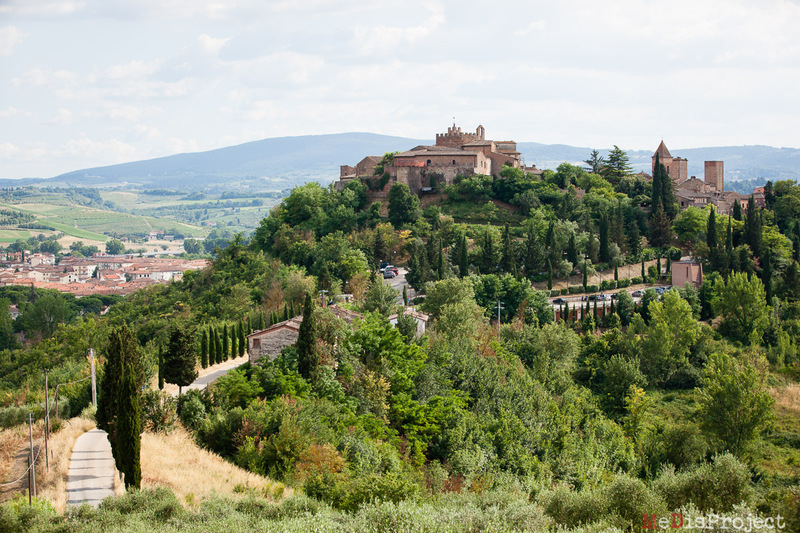 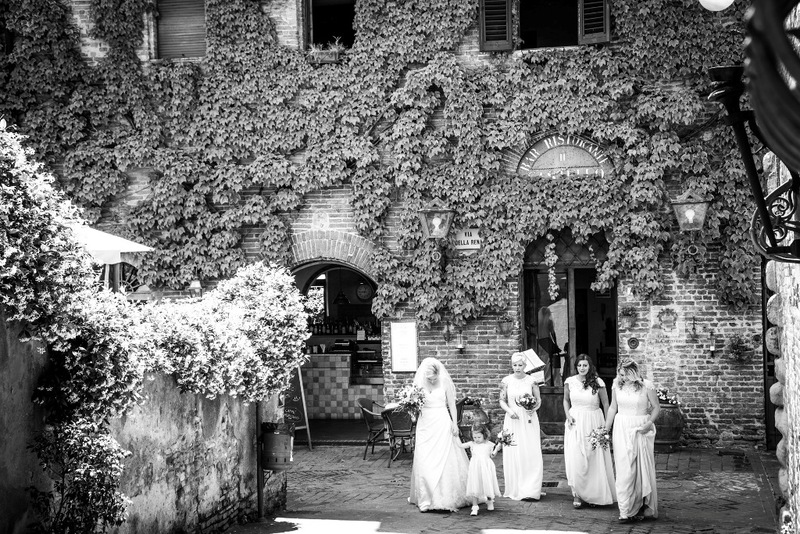 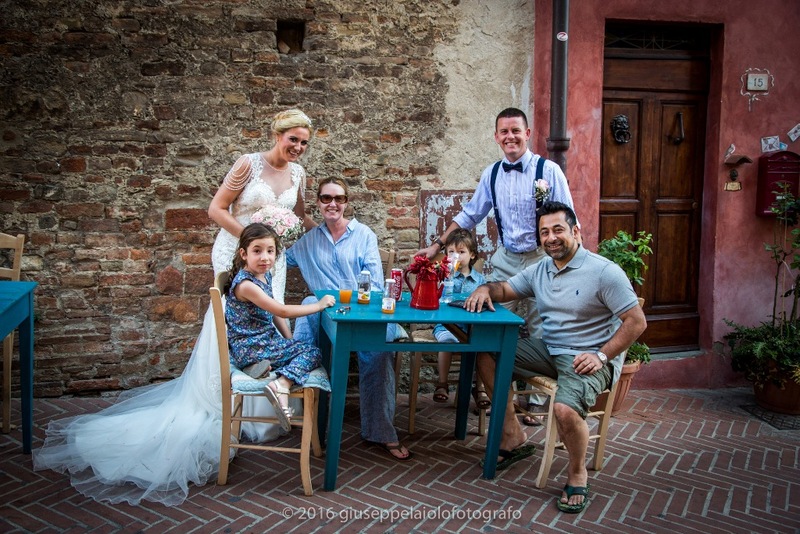 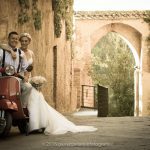 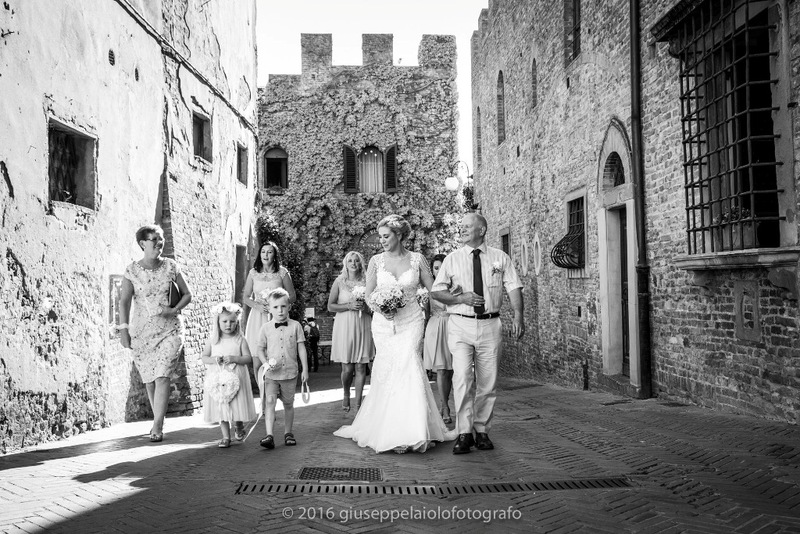 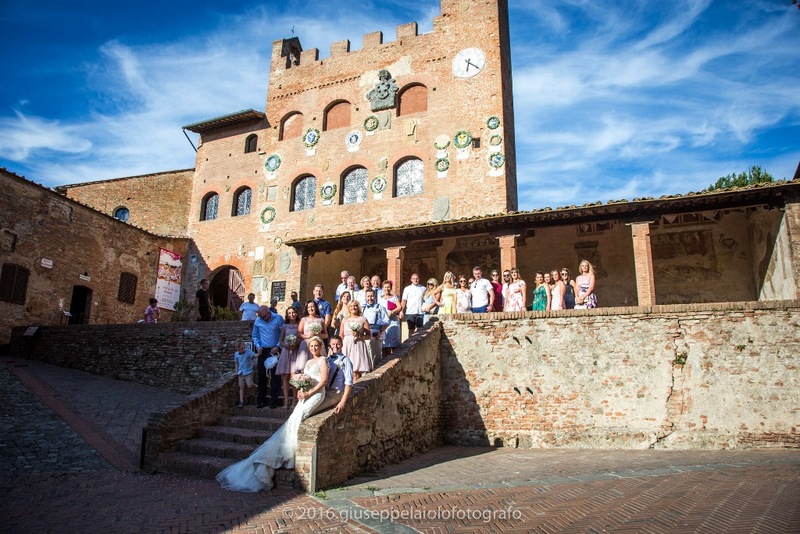 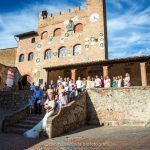 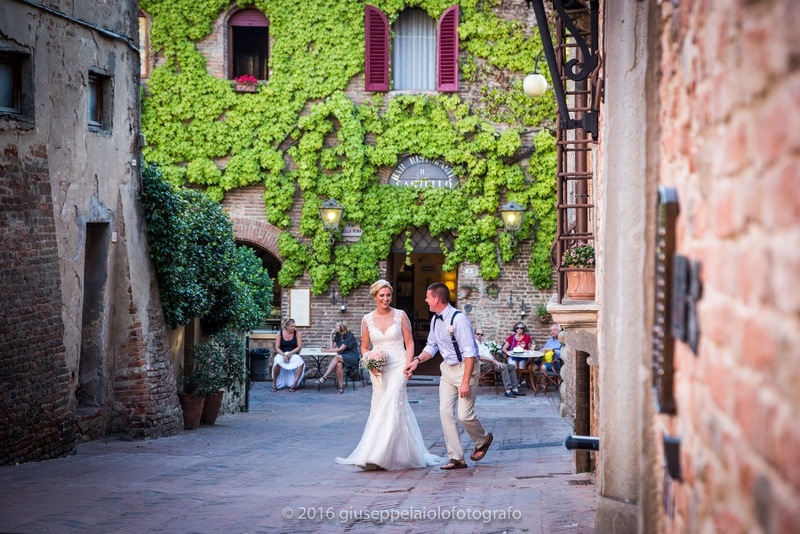 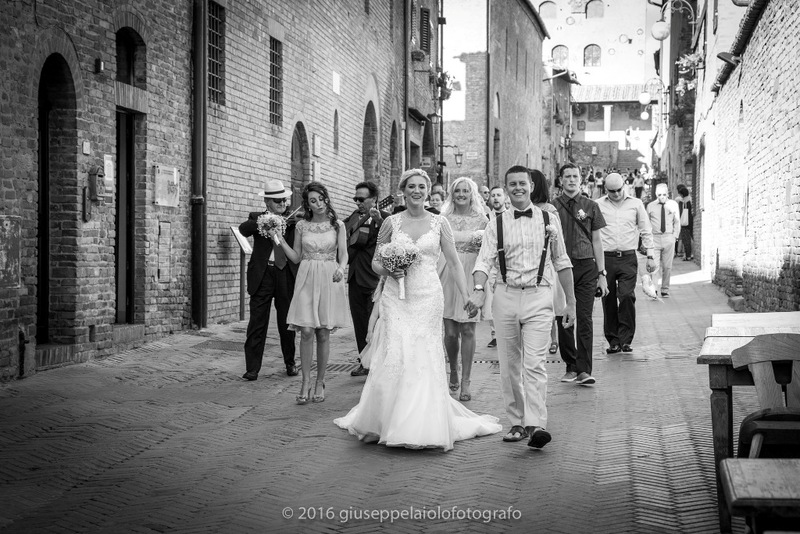 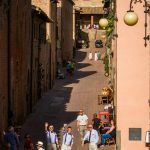 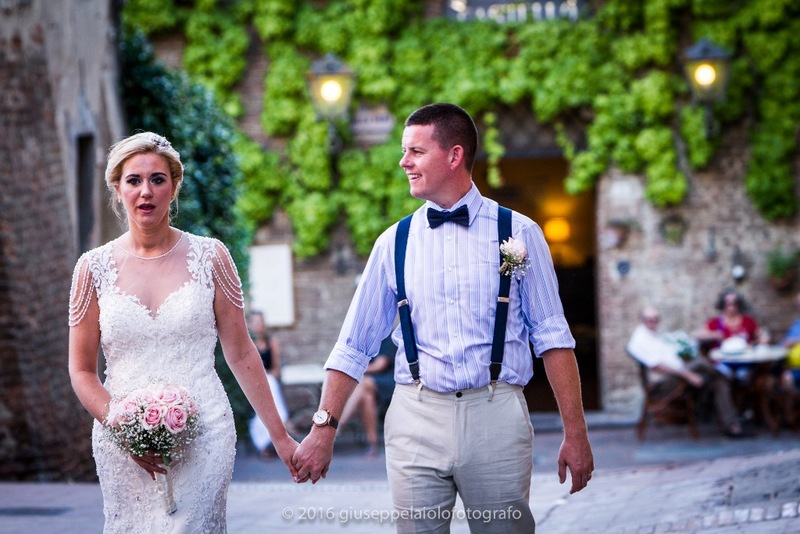 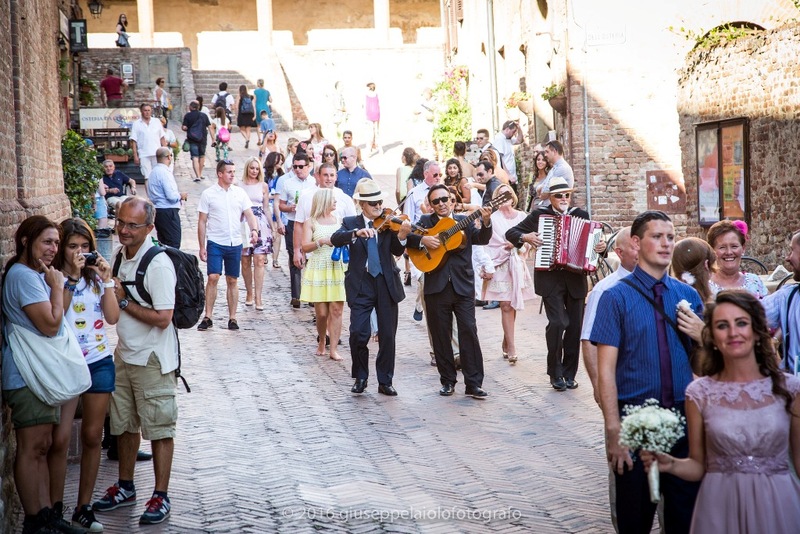 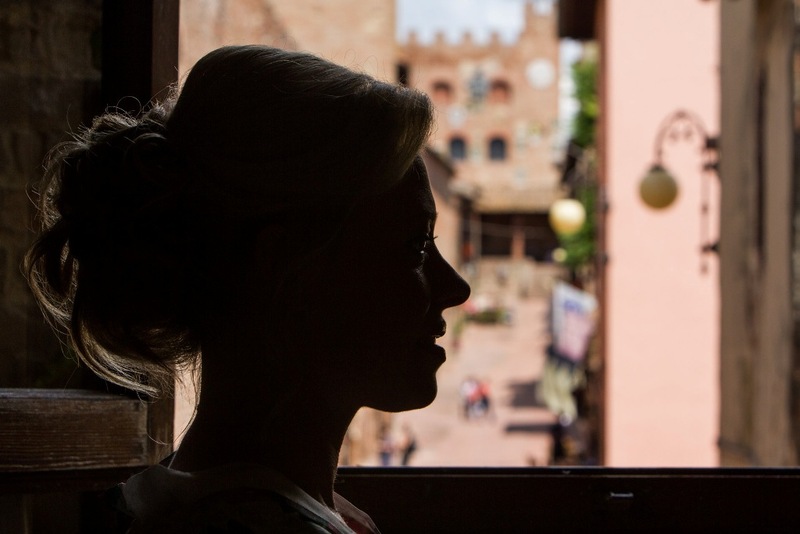 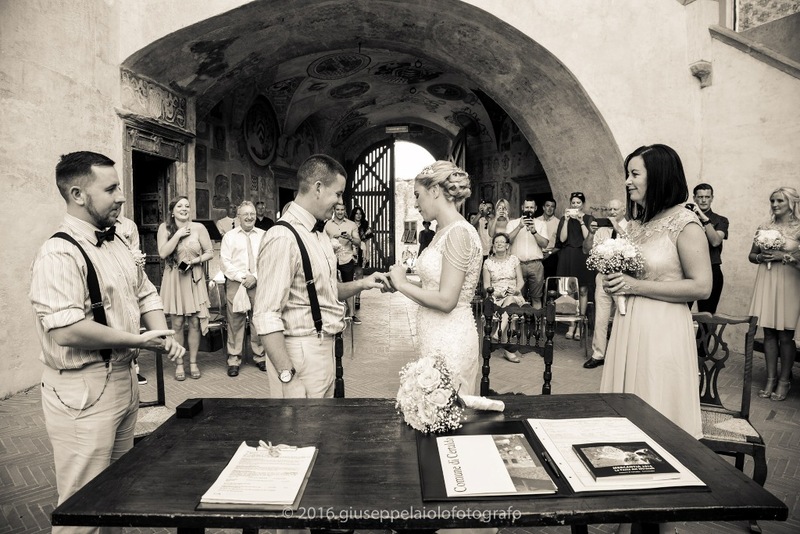 A Catholic wedding can be performed in the church of Certaldo, San Gimignano or in Santa Maria a Chianni.